Luke Cage has been around for 44 years, originally conceived as a character to pull in readers and money from the 1970s blaxploitation film craze. Whole swaths of his publishing history are filled with poorly executed stories cranked out on deadline, but even these offer some surprising moments of poignancy. Over the last few weeks, I’ve been re-reading as many Luke Cage comics as I can get my hands on in preparation for the Friday debut of the TV adaptation. By 1978, Luke Cage had adopted the superhero sobriquet of Power Man, as a way of marketing his crimefighting-for-cash business and masking his past as an ex-con. There are metric tons of unmemorable stories in the character’s back-catalog, filled with goofy villains-of-the-month, overheated romantic melodrama, and wince-inducing attempts at portraying black life. The intentions were noble, by and large, but lacked the kind of sustained commitment and creative staff that made titles like Amazing Spider-Man standouts of the era. Steeplejack dies at the end of this issue so one could say that he got what was coming to him. But he’s not the target referenced in the headline above. The story where Cage is contacted to see if he’ll kill someone happens in Power Man Annual #1. Most of that extra-sized installment—written by Chris Claremont, with art by Lee Elias and Dave Hunt, lettering by Denise Wohl and color by B. Wilford—is standard-issue 1970s superhero comic fare. This story happens when Cage was still in his hot-tempered, jive-talking hero-for-hire mode and is largely concerned with Power Man’s efforts to stop C-list villain Moses Magnum, a mad scientist-type who’s building an earthquake machine. The best part of the story is the flashback showing how Cage got the gig. Mrs. Sheridan doesn’t take kindly to Cage’s refusal, exploding with anger and then a surprisingly emotional entreaty that recounts the trials she’s been through. It’s the last panel in the page above that really hit home for me. In particular, two parts are especially effective. When Mrs. Sheridan mentions family and says that Luke understands things like that, it’s very likely that Claremont was gesturing at how institutional racism has historically torn black families apart. The second spike—the offhand mention of a lynching—buttresses the first, making it clear that Mrs. Sheridan is referencing their common background to make her case to Power Man. Cage takes the case after hearing all of that because, really, how could he say no? Those pages are the best elements in an otherwise unremarkable package and show some glimmer of what could be accomplished with a black character in mainstream superhero comics at the time. Characters like the Black Panther were fighting racism explicitly by battling the Ku Klux Klan, but this use of blackness was different. As a wealthy black woman advanced in years, Amanda Sheridan is already an anomaly. 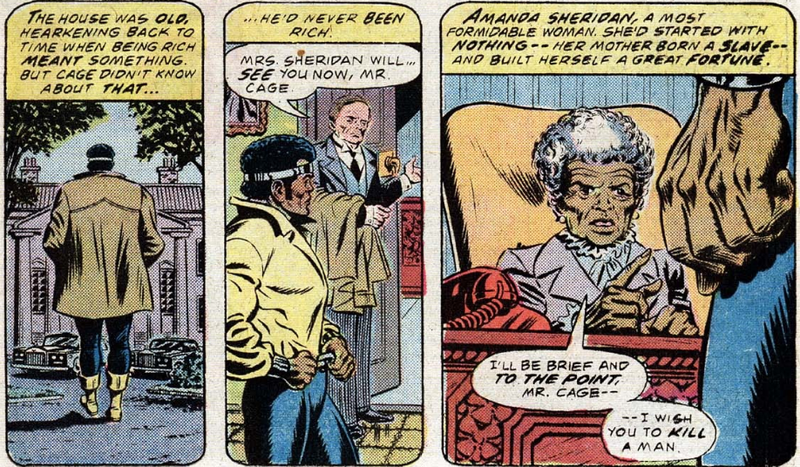 Her exchange with Cage is even more anomalous because it humanizes both characters by calling on the more tragic aspects of the black experience in the United States. By this point in Luke’s career, the reader doesn’t know much about his family or personal history. Parents and siblings won’t show up for a long while yet. Nevertheless, Claremont seems to trust that the reader will believe Cage has had similar losses in his past. Maybe it’s because the novel Roots had become a best-selling fictionalization of author Alex Haley’s lineage stretching back to America’s days as a British colony. Or it might be because the increase of black representation in mainstream TV, movies, and literature allowed for more depth in portrayals of black life. Whatever the reason, the result comes out pointedly in the character of Amanda Sheridan, who has a uniquely specific motivation for wanting to safeguard her granddaughter. Luke Cage is the best superhero for this story, not because he’s fighting racism but because, somewhere deep in his background, he knows the toll it can have on a family.